On 25-30 March 2018, with the blessing of His Holiness Patriarch Kirill of Moscow and All Russia and on the instructions of Metropolitan Hilarion of Volokolamsk, chairman of the Moscow Patriarchate’s Department for External Church Relations, Hieromonk Stefan (Igumnov), DECR secretary for inter-Christian relations, visited Baghdad and the Kurdistan Region of Iraq. 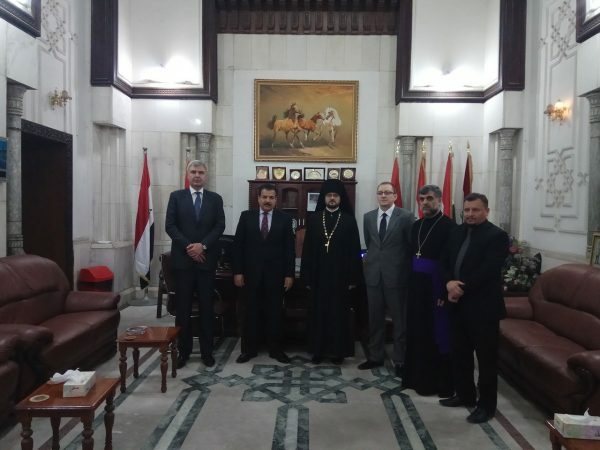 The visit was aimed at intensifying the cooperation of the Russian Orthodox Church with the Christian Churches and other religious communities in Iraq in the context of the efforts taken by the Moscow Patriarchate to render assistance to the population of the Middle East affected by the tragic events of the recent years. Hieromonk Stefan (Igumnov) was accompanied by Cor-Bishop Samano Odisho, representative of the Assyrian Church of the East in Russia. 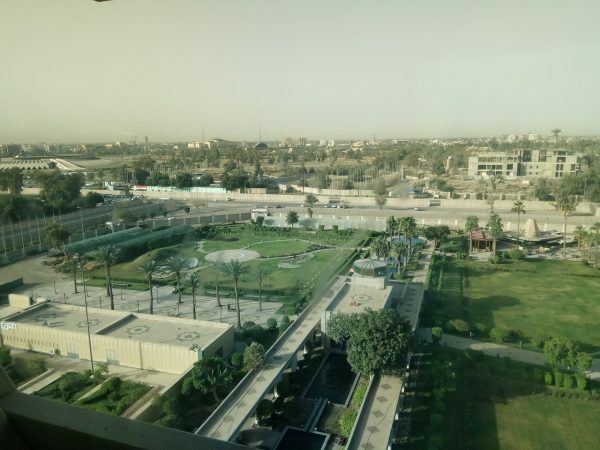 Taking part in the meetings in Baghdad were Mr. M.K. Maximov, Ambassador Extraordinary and Plenipotentiary of the Russian Federation to the Republic of Iraq, and Mr. V.V. Vavilin, Attaché of the Russian Embassy. Upon his arrival, the representative of the Russian Orthodox Church met with Mr. R. Kajakh Ji, head of the Iraqi Administration for Religious Property of Christians, Yazidis and Mandaeans. They were joined in the meeting by representatives of the aforementioned religious communities, who expressed deep gratitude to the Russian Orthodox Church and His Holiness Patriarch Kirill for showing concern for their needs. On March 26, Hieromonk Stefan met with representatives of the state authorities – the head of the National Reconciliation Committee of the Government of Iraq, Mr. J. Husseini, and the First Deputy Minister of Foreign Affairs of Iraq, Mr. Nizar Al-Khairalla. The participants in the meeting discussed various issues pertaining to the steps that the Iraqi Government takes to restore peaceful life in the country and to protect ethnic and religious minorities. That same day Hieromonk Stefan held a meeting with members of the Council of Christian Churches of Iraq, who told about the afflictions that Christians in Iraq suffered over the last fifteen years, having fallen victim to the civil chaos which had broken out in the country as a result of the external military intervention and terrorists’ attacks. The hierarchs emphasized that Iraq had no benefit of the western countries’ policy and that Christians and other ethnic and religious minorities pin great hope on Russia. On March 27, the representative of the Russian Orthodox Church met with His Beatitude Louis Raphaël I Sako, Patriarch of the Chaldean Catholic Church, visited a camp of the Christian refugees in Baghdad, and met with Mr. Yonadam Kanna, a member of the Parliament of the Republic of Iraq and one of the political leaders of the Christian community of the country. The same day in the evening Hieromonk Stefan met with Sheikh Dr. Humam Hamoudi, one of the leaders of the Shia community of Iraq, First Vice-Speaker of the Iraqi Parliament, to discuss the prospects of cooperation between the Russian Orthodox Church and the Shia community of Iraq. At the invitation of Mr. M.K. 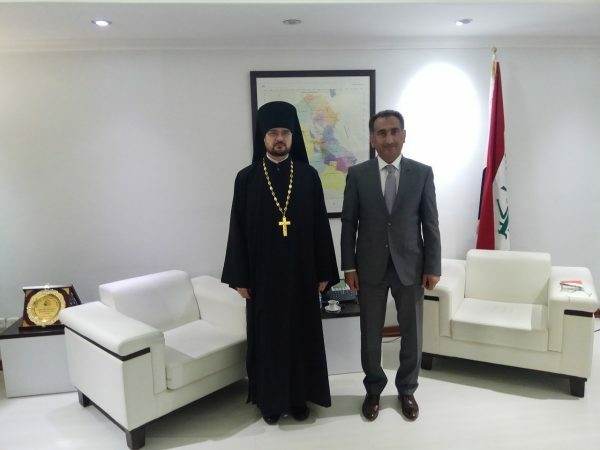 Maximov, Ambassador Extraordinary and Plenipotentiary of the Russian Federation to the Republic of Iraq, Hieromonk Stefan (Igumnov) and Cor-Bishop Samano Odisho visited the Russian Embassy in Baghdad. Fr. Stefan presented the Russian diplomats with an icon of St. Nicholas the Wonderworker and wished them God’s help in their service for the good of the homeland. At night of March 28, the delegation from Russia arrived in Erbil, centre of the Kurdistan Region of Iraq. In the morning of March 28, Hieromonk Stefan met with Mr. K. Muslim, Minister for Religious Affairs and Endowments and Minister of Education of the Government of the Kurdistan Region of Iraq, who told the guest about the steps that the administration of the Kurdistan Region takes to support the population of the region affected by terrorists’ attacks. Hieromonk Stefan and Cor-Bishop Samano Odisho also visited a refugee camp in Erbil which can accommodate one thousand and five hundred families and talked with the refugees who noted that the process of people’s returning to the settlements liberated from terrorists is taking place, but is very slow because of the lack of security guarantees. Particularly tense is the situation in Mosul. In the evening of March 28, Hieromonk Stefan visited the residence of the Assyrian Patriarch in Erbil and met with His Holiness Mar Gewargis III Sliwa, Patriarch of the Assyrian Church of the East. His Holiness conveyed cordial greetings to His Holiness Patriarch Kirill of Moscow and All Russia and to Metropolitan Hilarion of Volokolamsk and emphasized that the Assyrian Church of East received support from Russia and the Russian Orthodox Church on numerous occasions. His Holiness Patriarch Mar Gewargis noted with special satisfaction the assistance rendered in establishing the Assyrian parish in Moscow, which for many years has been successfully developing under the guidance of Cor-Bishop Samano Odisho. The participants in the meeting discussed further joint projects of the Assyrian Church of the East and the Moscow Patriarchate, aimed at supporting Christians in the Middle East, and noted the successful work of the Commission for Dialogue between the Russian Orthodox Church and the Assyrian Church of the East. 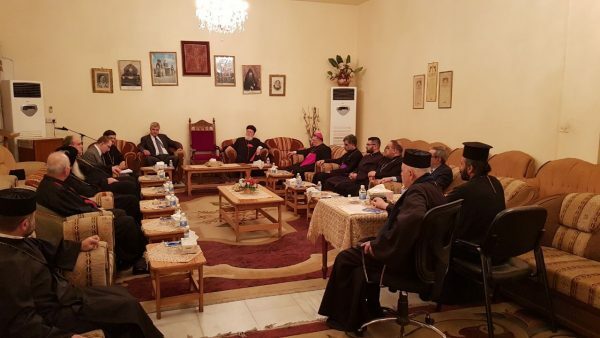 On March 29, Hieromonk Stefan (Igumnov) and Cor-Bishop Samano Odisho visited some areas in the north of the Nineveh Valley, and the city of Dohuk, where they met with leaders of the local Christian organizations that render aid to the suffering population of the Nineveh Valley. On March 30, Hieromonk Stefan met with members of the Spiritual Yazidi Council headed by Baba Sheikh Khurto Hajji Ismail. As the members of the Yazidi community told their guest, most of the Yazidi settlements in north Iraq were destroyed by terrorists, a considerable number of the Yazidis are now in refugee camps, and many women and children are still held captive, being subjected to humiliation and violence. That same day the delegation visited the Consulate General of the Russian Federation in Erbil and left for Moscow.